Don’t rush for braces or surgery - there’s more you should know. Click to view our videos about our treatment! Dr. Hugh Van Kieu, DC, IDE, is one of only a few Scoliosis Intensive Care Certified doctors in the world. Scoliosis Intensive Care (IC) Certified doctors are trained to achieve results after only 1-2 weeks of care that would normally require 3-6 months of traditional chiropractic treatment. In addition, IC Certified doctors utilize techniques that substantially lessen the high levels of physical and emotional stress often experienced by patients receiving such traditional scoliosis treatment. more Since the commencement of our CLEAR Certified IC Scoliosis treatment in 2011, we have achieved impressive results in correcting the curvature of the spine. 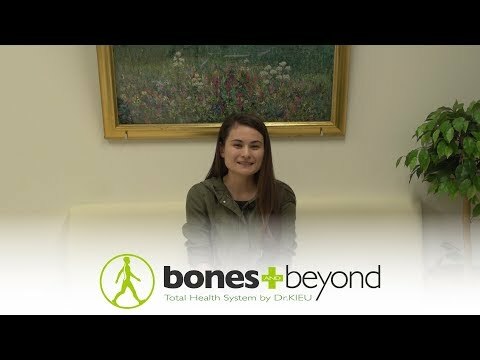 Prior to coming to Bones and Beyond, this person had already undergone 3 years of stressful medical care and rehab with ineffective results and had been told that surgery might be necessary if the curvature continued to worsen. With 2 weeks of our IC scoliosis treatment, major scoliosis curvatures in both the lower neck and upper back were substantially reduced. This person was told at the hospital to wear a brace for 23 to 24 hours a day but had found that she couldn’t because doing so was too painful. Since the spine had not yet become rigid (which wearing a brace for a long period can cause the spine to become), we were able to reduce the curvature from 44 to 18 degrees. more Our Intensive Care (IC) Scoliosis Treatment, developed, certified, and supported by CLEAR Institute, is the most advanced scoliosis reduction method in the world. The CLEAR scoliosis reduction method is a revolutionary approach that has been proven capable of not only stabilizing but also substantially reducing scoliosis curvature without the need for a brace or surgery. IMPORTANT What does it mean to be CLEAR IC (Intensive Care) Certified? Call us for any questions related to scoliosis treatment, chiropractic, or any physical symptoms. Working in harmony with your body and mind's natural healing capacities, Dr. Kieu will help you achieve your goals . . . pain free . . . health-wise . . . and naturally! NEW [2017/04/22] Dr. Kieu was invited to an university hospital in China to give a lecture on spinal cord (scoliosis).